Celebrating 41 Years of All Things Super! Tara Strong began her acting career at the age of 13 in Toronto, Canada. She landed several TV, film, and musical theater roles as well as her first lead in an animated series as the title role of “Hello Kitty.” After a short run at Toronto’s Second City theater company, she moved to Los Angeles with an extensive resume that included her own sit-com and well over 20 animated series. Upon arriving in Hollywood, she quickly made her mark in several TV and Film projects, such as “Party of Five,” “National Lampoon’s Senior Trip,” “Sabrina the Teenage Witch,” and more. She has an iconic voice-over career, including roles such as Bubbles in “The Powerpuff Girls,” Timmy Turner in “The Fairly OddParents,” Dil Pickles in “Rugrats,” Raven in “Teen Titans,” “Batgirl,” “Family Guy,” “Drawn Together,” “Ben 10,” Melody in “The Little Mermaid 2,” “Spirited Away,” as well as many others. She is Miss Collins on Nickelodeon’s “Big Time Rush” and the current voice of “Harley Quinn.” She is Emmy nominated, a Shorty Award winner, Twilight Sparkle in “My Little Pony: Friendship is Magic” and currently playing “Unikitty” in the new hit series. She appeared in the Hallmark Christmas movie, “A Very Merry Toy Store.” She has an amazing 350,000 twitter followers (@tarastrong) and has used her social media to raise several hundred thousand dollars for kids with cancer and animal rescue groups, as well as using her commanding voices for her anti-bullying platform. 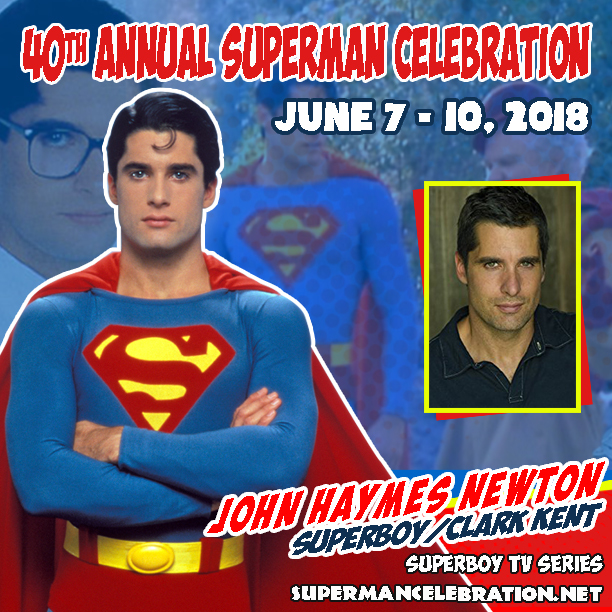 With his muscular physique and dark good looks, John Haymes Newton seemed perfectly cast in the dual role of the teenage Clark Kent and his alter ego “Superboy” in the 1988 syndicated series. But after one season, he was replaced by another actor and instead began to carve out a career on stage and screen. The native North Carolinian headed to Manhattan at age 19 to study acting and soon found himself headlining a TV series. After leaving “Superboy”, John Haymes Newton garnered praise for his leading role in a 1990 production of “Out Town” at the Pittsburgh Public Theatre. John Haymes Newton’s film career did not begin particularly auspiciously, playing a romantic rival to rapper Vanilla Ice, both vying for the affections of Kristin Minter, in “Cool as Ice” (1991) and graduated to leading roles with “Desert Kickboxer/Desert Hawk” (1992), playing a half-breed cop fighting drug dealers in Arizona. The role required the actor do little more than pose and look good while executing low-level martial arts stunts. “Alive” (1993) gave John Haymes Newton more to do as one of the survivors of a plane crash in the Andes. Returning to the small screen, John Haymes Newton cut a handsome figure as the driver for Eliot Ness in the syndicated series remake of “The Untouchables” (1993-94). He seemed to find his niche when cast as a mysterious stranger who comes to the aid of Cassidy Rae in the Fox primetime soap “Models, Inc.” (1994-95). Building on that performance, John Haymes Newton joined the cast of another of the network’s serials, “Melrose Place”, in 1998, portraying Ryan McBride, an executive who also happened to be the younger brother of restaurateur Kyle McBride (played by Rob Estes). 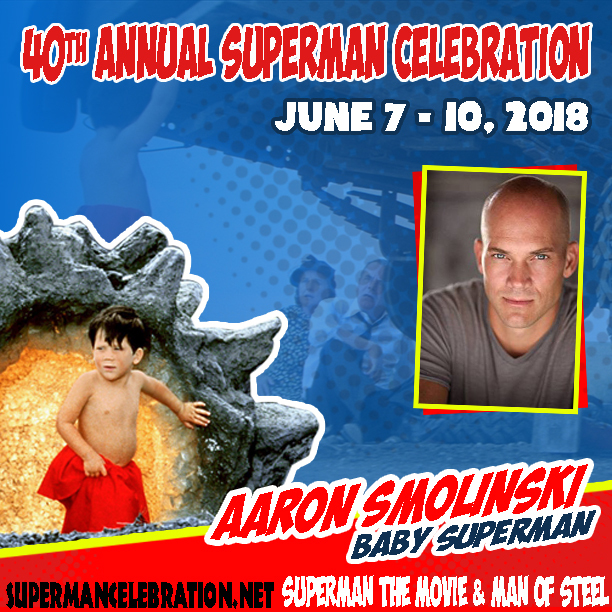 John Newton will participate in a special Superboy 30th Anniversary Q & A and meet fans on Saturday. Jeff East was born in St. Louis Missouri and currently calls Nice France his home. His professional acting career began at the age of 14 with his role as Huckleberry Finn in the United Artists feature films Tom Sawyer (1973) and Huckleberry Finn(1974). 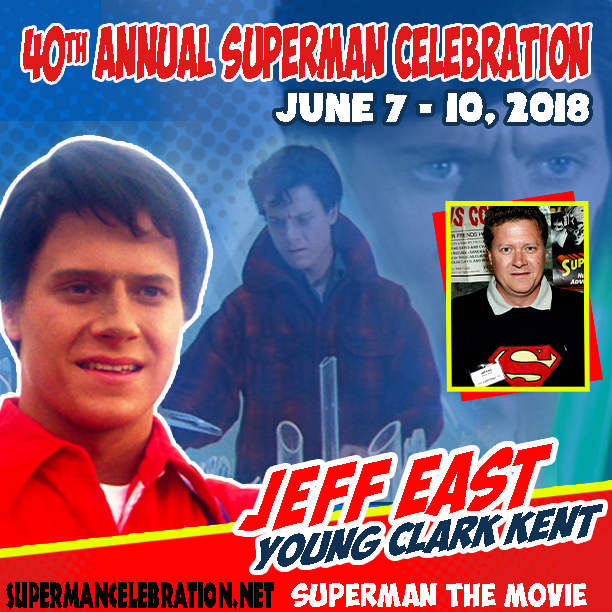 East is known for his portrayal of teenage Clark Kent in Alexander Salkind’s Superman: The Movie in 1978. East’s feature film credits include: Flight of the Wolf (1974), Summer of Fear aka “Stranger in Our House”(1978), Mary and Joseph: A Story of Faith(1979), Klondike Fever (1980), Deadly Blessing(1981), Up The Creek(1984), Dream West(1986), Pumpkinhead(1988), Another Chance(1989) and Deadly Exposure(1993). East also hit the small screen with roles in television series: Walt Disney’s Wonderful World of Color, How The West Was Won, The New Adam-12, M*A*S*H*, 1st & Ten: The Championship, Doogie Howser M.D., and more currently, Ransom’s Law. 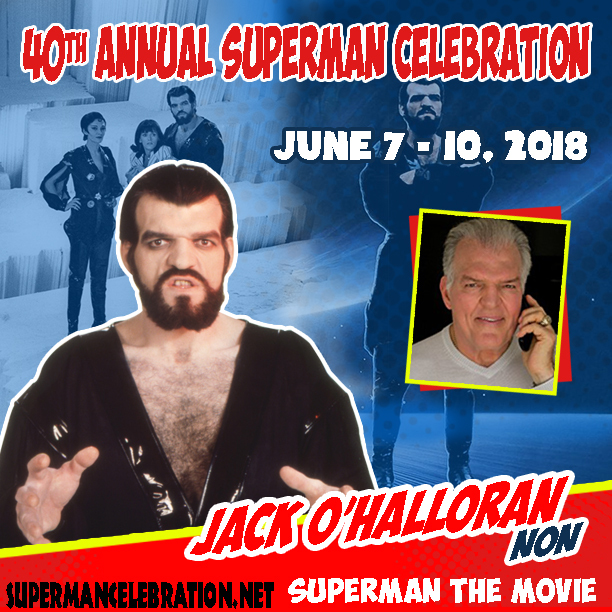 Jack O’Halloran is best known for his role as Non, part of the trio of villains led by Commander Zod, in both the original Superman and Superman II. Standing at 6’6”, Jack has played villainous roles not only in Superman, but in The Baltimore Bullet(starring James Coburn and Omar Sharif), Dragnet (the Dan Aykroyd/Tom Hanks comedy based on the hit TV series) and the Chuck Norris vehicle Hero and The Terror. Jack’s acting career is only part of his story. Before he became an actor, he was a professional boxer active between 1966 and 1974. “Irish Jack” as he was known, was considered to be one of boxings most promising heavyweight hopefuls. Jack fought a total of 57 fights, winning 34 with 17 KOs, losing 21 fights (being knocked down 8 times) and drawing 2. Jack has written a book called Family Legacy (due out in November). The book is based on the life of his father, Albert Anastasia. Jack’s father is best known as the head of Murder, Inc., an organization that enforced the decisions of the ruling council of the mafia. 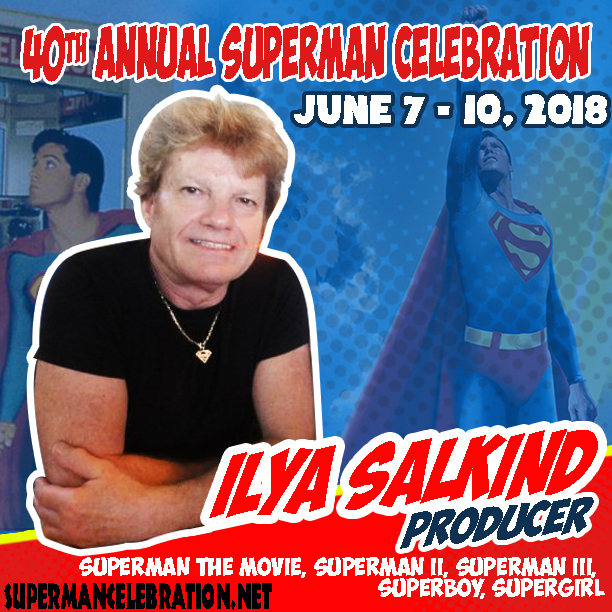 Jack O’Halloran will be available to meet fans on Friday and Saturday and will take part in a special 40th Anniversary of Superman: The Movie Q & A.
Ilya Salkind was born in Mexico City, and grew up in the world of motion pictures. At a young age, Ilya started his career as a producer and has accumulated a stunning filmography. Ilya produced, with his father and grandfather, the tremendous worldwide box office hits The Three Musketeers (1973) and The Four Musketeers: Milady’s Revenge (1974), which was the first time in the industry a film and its sequel were shot simultaneously. Ilya was nominated for a Golden Globe for his work on The Three Musketeers (1973). Ilya then went on to initiate the blockbuster “Superman” franchise, one of the most successful in film history. The Academy Award-winning Superman (1978) also has the distinction of being the first major Comic Book film adaptation ever made. Under Ilya’s supervision, this film and its first two sequels became worldwide blockbusters. Superman II (1980) was awarded the Best Science Fiction Film of the year by the Academy of Science Fiction, Fantasy & Horror Films. Ilya’s venture into television, Superboy (1988) (1988-1992), also proved successful, lasting four seasons for a total of 100 episodes. The show was recognized by the Young Artist Awards as one of the Best Family Series on television. After producing the $50 million Christopher Columbus: The Discovery (1992) with Marlon Brando, Benicio Del Toro, and Catherine Zeta-Jones, Georges Corraface, in the role of Christopher Columbus, Ilya and wife Jane Chaplin (daughter of Charles Chaplin and granddaughter of Eugene O’Neill) settled down in Orlando, Florida and took a sabbatical to raise their two young sons. The celebrity couple amicably parted ways at the end of 1999. Ilya, now based in LA and having formed The Ilya Salkind Company, Inc., Ilya Salkind has a reputation for discovering new talent throughout his career, including Christopher Reeve (Superman), Helen Slater (Supergirl), and Catherine Zeta-Jones and Benicio Del Toro (Christopher Columbus: The Discovery starring Marlon Brando). Alexander the Great from Macedonia is geared for a 2006 summer release and aimed toward a teen audience.